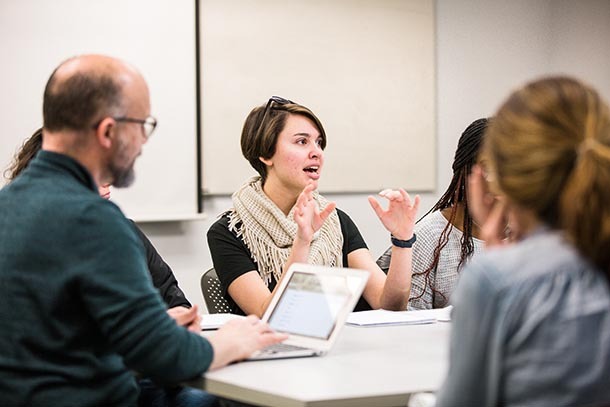 At Columbia College Chicago, all undergraduate students complete requirements of the Core Curriculum, which provides a solid foundation in the liberal arts and sciences. The Honors Program offers an enhanced core curriculum experience tailored to our high-achieving undergraduate students. If you seek a greater academic challenge, the Honors Program is for you. You'll be in a classroom with other students who, like you, are eager for an intense intellectual experience with deeper levels of inquiry, and you'll study with faculty who have heightened expectations of student work and engagement. Your Honors participation will also show up in official college transcripts, giving you a leg up when you market yourself after graduation. The first step is to apply for admission to Columbia. Admissions reviews every application for Honors consideration. If you meet the criteria, you will receive an invitation to the Honors Program with your admissions letter. If you don't get an invite right away, don't worry! All students with a 3.5 Columbia GPA or higher are also eligible to enroll in Honors classes. If you believe your records support admissions into the Honors Program, or if you have questions about taking an Honors course in your first semester at Columbia, contact honors@colum.edu. Transfer students are eligible for Honors. However, because Honors courses fulfill Core (or "general education") requirements, and because transfer students have often completed a substantial number of these credits, you may need to work with college advising to meet Honors Program requirements as a transfer student. If you have junior standing, you can take an Honors Undergraduate Research Mentorship Initiative course to fulfill up to three credit hours toward the requirement. The collaborative opportunities that come with being a part of the Honors Program aren't just found in the classroom. Honors students are eligible to live on Honors-only floors in our residence halls, which also have resident assistants who are in the Honors Program too. Honors students also are invited to attend exclusive social events and educational trips around the city, participate in Honors-only activities on campus, and study and socialize in the exclusive Honors Program Lounge. This course examines the history of the development of the U.S. as an urban nation. It analyzes the rise and decline of various urban systems that developed over the course of American history. Students investigate the social, economic, political, technological, and demographic trends that have shaped the modern American city. This class concerns the relationship between written and filmed versions of a story, novel, or play. Course explores how character development, plot, narrative, symbols, and language are translated from text to film. This five-week summer course provides a hands-on introduction to paleontology field methods, including fossil reconnaissance, identification, and collection during a two-week field expedition to the Petrified Forest National Park in Arizona. This course examines the idea of global environmental change and the mechanisms by which global change occurs. Combining Earth history with modern Earth processes (Earth systems), the class explores changes in the physical environment like plate movement and climate change, and changes in the biological environment like evolution and extinction. The Undergraduate Research Mentorship Initiative (URMI) connects talented students with junior or senior standing who are interested in conducting academic research with faculty members involved in scholarly projects in their areas of expertise. Honors URMI courses can be taken for up to three credit hours toward the Honors Program requirement. Are you a current Columbia student who is in the Honors Program or wants to learn more? Visit the Honors Program page.